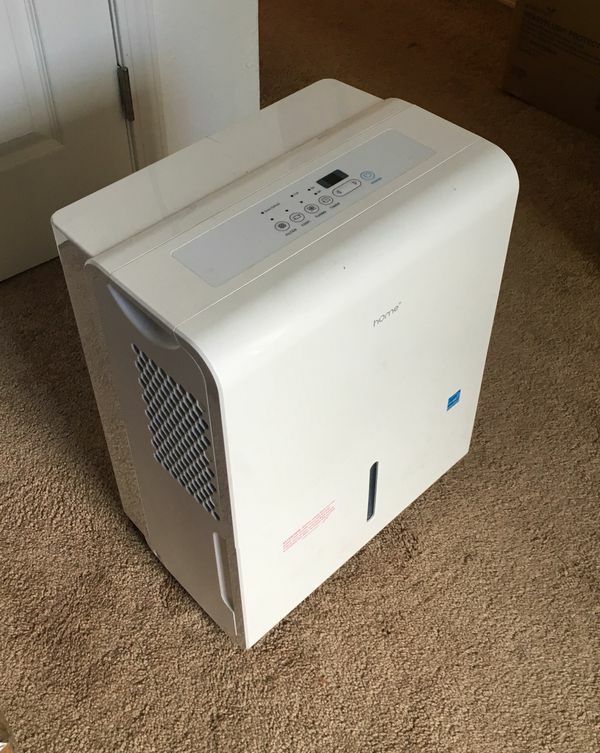 HomeLabs - 30 pint: Dehumidifier Review • The Air Geeks, reviews of air conditioners, dehumidifiers and air purifiers. If you are having trouble with bad odor and allergens in your house, it’s might be time to get a new dehumidifier. A good dehumidifier not only removes risks to your house building materials and furniture but can also alleviate health problems associated with humid environments such as sinuses and allergens. HOmeLabs 30-pint dehumidifier is a good option you can turn to. We’ll look at some of its main features so you can gauge if it can fit your indoor space, personality and price range of what you are looking for. First, this humidifier covers a space of up to 1000 sq. Ft, meaning if the space you are looking to dehumidify is larger, you might consider looking at its larger siblings or elsewhere. If you have large rooms, you can also consider placing two of this at both corners of the rooms to achieve desired outcomes. Its noise level is quite low for a dehumidifier, especially on low fan settings. This enables you to converse easily in the house without shouting and binge on your favorite Netflix show without even noticing it’s there. If you can bear with white noise while sleeping, the hOmeLabs 30-pint dehumidifier will let you sleep comfortably. Now, let’s look at its dehumidifying capacity. Per every 24 hours, running at full capacity, this dehumidifier will absorb 4 gallons (30 pints) of moisture from your indoor space. Since its water tank’s capacity is around 0.8 gallon, you will have to keep checking the level of the water absorbed so you can empty it. The appliance also has another way to relieve the stress of having to empty the tanks every so often through an outlet to connect it with a hose that can drain the water to a larger reservoir or to the house drainage pipe network. It must also be noted that the hosepipe draining system works with the help of gravity as the dehumidifier does not have a pump. You will have to, therefore, consider placing it in a raised area from the reservoir. The control panel is very user-friendly and hassle-free to navigate with its auto-shut and auto-restart features in case you are not around. Once the dehumidifier water tank is full, the appliance automatically shuts off to avoid overflowing of water which can damage the same floors and furniture you are trying to protect. There is also a timer in case you want it to run for a specified amount of time and a reminder to clean the filter. This appliance also saves settings in case there is power outage so you don’t have to keep resetting the controls every time you power it on. Automatic shut-off features are very important features to consider not only for convenience but also for security as this means that in case of irregular power supplies or electrical surges, the appliance won’t start fires in the house. 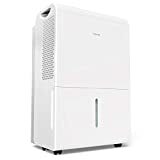 This dehumidifier is well designed and for such a huge box, the design team really did put into considerations that it could be an eyesore to some people. The team, therefore, designed a stylish and sleek appliance that blends very well with any furniture settings. It is also fitted with small caster wheels to enable easy movements if you want to move it to another spot in the room. It is also fairly easy to lift although we would advise extra care especially extra care when handling it. The energy rating is high for this device meaning you can run it for the whole day and your electricity bill won’t skyrocket significantly when compared with dehumidifiers of the same price range. One of these goes for about $150 with an additional 2-year warranty in case anything stops working. You will also not have to replace the filter every often as it is washable and there is a reminder in case you forget to clean it. Washable Filter: This means you get rid of bacterial accumulation on the filter without having to replace it. Small Water Basin: You will have to empty several times a day if you don't have a hose pipe you can connect for continuous drainage. Runs quietly and works like a charm. The reservoir isn't as big as some others, but this unit runs quietly, has a sleek and modern look and works fine in my basement. It has an automatic shut off when in gets full. You can put it on a timer to run, or set it to continuous. Has several settings to choose from. I love it!" Great purchase. Incredibly effective, and has helped to keep allergens at bay in our very damp basement. We have the machine set to run so that there's no more than 35% humidity "allowed" in the basement, and even though it's kind of loud, it does an excellent job without boosting our energy bill super-high." As you have seen, looking at its features, this humidifier is ideal for small spaces where the occupants need a stylish and elegant look to compliment the look of your furniture. Not many dehumidifiers are able to provide all these features in that price hence the hOmeLabs 30-pint dehumidifier is a high recommend from us. If you are looking to cover a larger space, however, you might consider buying a larger appliance than this one. If you are impressed by the above features, then its time you make a move by going ahead and making a purchase. We appreciate you for taking time to read this guide and we trust you’ll make a wise make a wise decision. Feel free to browse our other guides on dehumidifiers if you find this unsatisfactory.